Beginning with the 2018-19 school year, the UIL will split Class 5A schools into two divisions based on enrollment prior to the season. Each week this summer, we will take a peek at the seven football programs that will compete in District 11-5A Division I. This week, we continue the series by looking at Cedar Park. Where we left off: The Timberwolves overcame an injury to state-championship-winning quarterback Mak Sexton and put together an 11-2 campaign that included a District 19-5A championship and a trip to the regional quarterfinals. 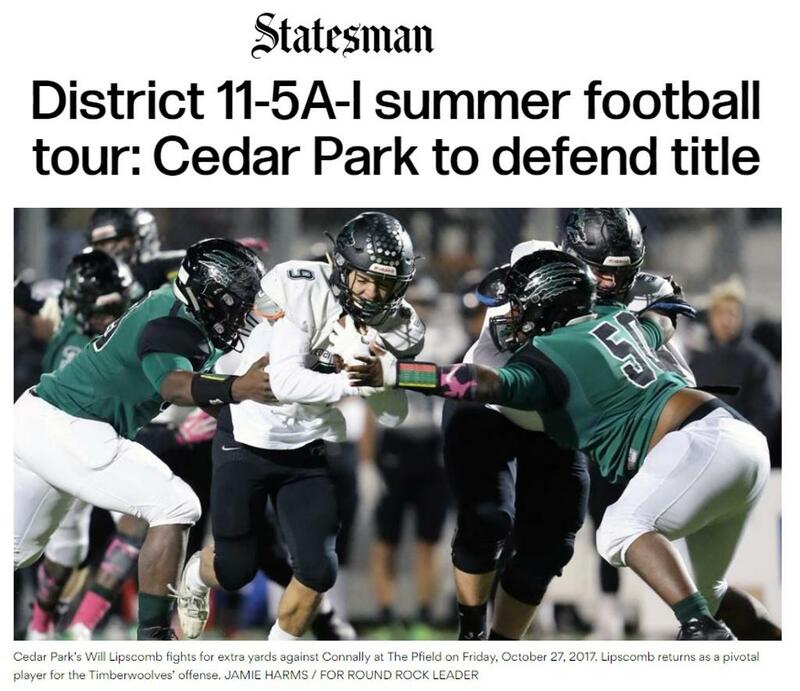 A plucky defense and a quarterback-by-committee system led Cedar Park to a come-from-behind 28-27 win over Georgetown, a 21-14 victory over Connally and a 35-25 triumph over Hutto to enter the playoffs on a nine-game winning streak. Cedar Park dispatched Magnolia 24-20 and Ennis 17-14 before succumbing to state runner-up Manvel 56-17. The Timberwolves have won six straight district titles entering this season. Who’s gone? Any time you lose a quarterback with a state title ring, it is going to be a setback, but the Timberwolves got a taste of life without Sexton after a season-ending injury against Georgetown. District 19-5A Defensive MVP Keegan Nichols is also gone. Top offensive and defensive linemen Jonathan Kelly and Levi Russo both graduated. Wide receiver Payden Sawiki, offensive linemen Mason Brooks and Trajan Chase, linebackers Jackson Buckingham and Bradley Lovell, safety Austin Hewitt and running back Luke Policke are among the 12 departing starters. Who’s back? Defensive tackle BJ Jones was an all-district selection last year. He will move to the offensive side of the ball, where he will anchor the tradition-heavy Cedar Park line. Wide receivers Brandon Breed and Carson Neel are dangerous weapons on the outside. They combined for 60 catches and eight touchdowns. Running back Will Lipscomb will likely become the feature back in the Timberwolves’ offense after leading the team in rushing last year. On defense, look for big things out of rising junior Ben Bell. The defensive tackle broke into the starting lineup on a senior-laden team as a sophomore. Next to him will be Jesiah Whittington. The defensive end has the kind of athleticism that makes him a nightmare coming off the edge – especially on passing downs. On the other side, Jacob Munoz will help make up a defensive line that should be the strength of the team and help establish a new generation of “Black Rain” defense. Breakout player: Quarterback Ryan Fiala was called upon last year when Sexton went down, keeping the program’s run of district titles alive with some inspired performances down the stretch. He threw for 1,257 yards, 17 touchdowns and seven interceptions. Fiala has big-game experience and another year under his belt in the Timberwolves’ offense. With experience weapons at his disposal and a solid offensive line in front of him, Fiala could become a household name in 2018. ©2019 Cedar Park High School Football / SportsEngine. All Rights Reserved.